Although several institutions work under the emblem of Franz Liszt’s name, small is the number of those who know that the Liszt Academy of Music is the only institute in the world founded personally by the great composer. Franz Liszt who was also renowned for his pedagogical skills contended a lot for the establishment of a Music Academy in Budapest. His dream was finally realized in 1875. It is hardly an exaggeration to say that no other music school has had such an immense impact on the development of the world’s musical scene as the Liszt Academy. Liszt, Dohnányi, Weiner, Hubay, Popper, Bartók, Kodály are among the great names who figure in the Academy’s history and whose contribution to the world’s cultural heritage is immeasurable. Among our prestigious alumni, you can find names like Solti, Doráti, Végh, Tátrai, Ligeti, along with those who are now handing on the artistic legacy of the Liszt Academy Starker, Kurtág, Schiff, Eötvös, Kocsis, Ránki, Éva Marton, Miklós Perényi – names familiar to music lovers all over the world. Beside this worldwide influence the other uniqueness of the institute is that the legacy of Franz Liszt is still alive in present-day education. This precious tradition and the unique Hungarian style of teaching focusing on understanding music beyond technique make the Academy incomparable and unparalleled in the circle of musical education. Since its foundation in 1997, the Friends of the Liszt Academy has dedicated itself to promoting the Academy both in Hungary and internationally by nurturing of its flourishing tradition and by supporting the most talented students in their first professional steps. The last 13 years have proved how important and valuable this initiative is. According to Hungarian law anybody studying for a second degree has to pay tuition fee. Most of other universities provide students with scholarship opportunities or do not claim tuition fee, therefore more and more Hungarian talents choose to study abroad for a second degree. With our scholarship programme we would like to contribute to decreasing the number of talents that we are losing because of financial reasons. The other aim of this project is to help the very talented Hungarian students to devote as much time as possible to their artistic life. We intend to launch international scholarship programmes for international students to help them cover the tuition fee. With this project we aim to attract more highly talented international students. We would like to help our students and their teachers to participate in international competitions or master classes and we also plan to support youth orchestras. We are sure that the international presence of talented Liszt Academy students is one of the most effective way to increase the Academy’s reputation. After reaching a certain professional degree the quality of a musician’s performance depend a lot on the quality of the instruments. Unfortunately the budget of the Academy provided by the Hungarian State does not allow buying high-quality instruments although it would be indispensable for the students’ professional advancement. The organ in the Bach-hall of the Old Academy of Music needs to be renovated urgently not only for the reason that it has been already used for fifteen years but because this is the only available organ for the Academy during the reconstruction period of the main building. The fundraising activity has already commenced for this special project. 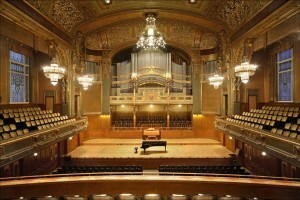 The main organ of the Music Academy Main Building at Liszt tér has to be removed during the 2-year reconstruction time, and a new organ must be built. The financing of this huge project needs to get additional support. The Organ Departments’ young and devoted professors envisaged an internationally active and attractive centre with other new small organs serving educational purposes. This long-term vision will need significant outside support as well. This project on one hand helps opening new doors and improving the training we intend to invite universally recognized professors and artists to hold master classes at the Liszt Academy. On the other hand to meet the increasing international needs we would like to organize summer courses at the Liszt Academy. These summer academies could not only increase our reputation but could generate income as well as attract international students who later could decide to study at the Liszt Academy. The budget provided by the Hungarian State does not cover itself all the expense incurred in the life of such a big institution like the Liszt Academy. We should try to find out other financial resources able to funding several types of activities which aren’t related closely to the teaching but are essentials to keep alive the unique character of the Academy. Should you have any inquiry about the projects, please contact us! Address: Régi Zeneakadémia, 1064 Budapest, Vörösmarty u. 35.